Samsung aims to boost their market presence in the mid-range category with the introduction of Galaxy C9 Pro which has killer features and not just a fancy name. Samsung used to be a tough competitor to beat in the Andriod sector. But for some time now, the Chinese manufacturers have been giving them a run for their money in the Nepali market. While the company has been managing to take out many variants, it lacked that clad-metal design phone in the mid-range market. They have made up for the deficit with their latest offering, Samsung Galaxy C9 Pro. With the Galaxy C9 Pro, Samsung has kept the simple candy bar like design with a slightly curved glass display. Despite the 6-inch Full AMOLED 2.5D display and a metallic body, the phone doesn’t feel big and heavy, and has a good resolution of 1920x1080p which is good enough to view HD videos. The new smartphone from Samsung scores points with its 6 GB RAM with additional expandable storage up to 256 GB via micro SD card, but disappoints when it comes to operating systems as it uses Android 6.0.1 (Marshmallow) rather than Android 7 (Nougat). Although the battery is just 4000 mAh, it has a fast charging feature which manages the bulk of the phone’s performance and battery life. Samsung has never been shy when it comes to boasting about their camera, and in Galaxy C9 Pro, they have featured 16 MP cameras both at the front and rear which will give a big thrill to photo enthusiasts, mainly selfie addicts. There is also a Pro mode in the phone that allows you to adjust the camera settings like ISO, shutter speed, exposure and white balance according to your needs. Although Samsung Galaxy C9 Pro lacks a bit of display, the latest operating system and 4K recording ability makes it worth the price of Rs. 59,900 for its killer cameras, battery feature, big screen, and above all, RAM of 6GB. 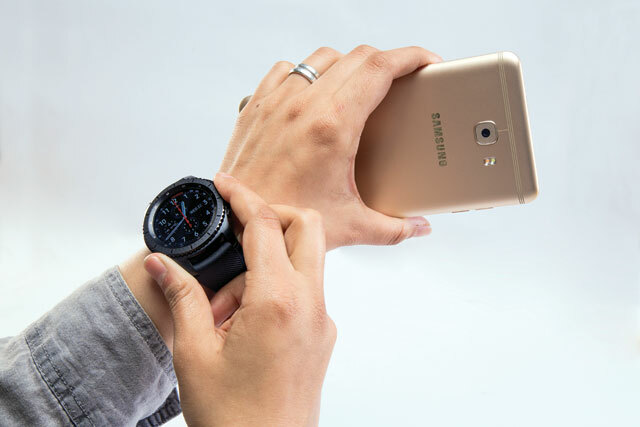 Gear S3 Frontier, the latest wearable watch by Samsung offers more than just great fitness features in a simple handy device. Samsung Gear S3 comes in two variants, Classic with a leather strap and Frontier with a rubber one. We checked out the Frontier as we didn’t want to soil the leather strap of the Classic version since we wanted to test it while working out. The Frontier version comes in a sportier design because of the rubber strap. The watch may be a bit big for some people, but it will catch the eyes of many when you flaunt it during workouts or at work. The weight of the watch is around 63 grams mainly because of the premium stainless steel body. Gear S3 Frontier has a 1.3-inch, 360 x 360 pixels AMOLED always-on display and is protected by Corning Gorilla Glass SR+. The display is surrounded by a rotating bezel which helps you to scroll through operations in the watch. The handy wearable is certified IP69 and can survive under 1.5 meters of water for about 30 minutes. The watch runs on Tizen operating system and is driven by 1.0GHz Dual Core Exynos processor, which does make the operation of the watch fast and is quite satisfactory when using it. Gear S3 has a RAM of 768 MB to 4 GB of internal storage, which allows smooth operation of the watch. A big bonus in the Gear S3 is the built-in GPS receiver to track your location even if you are not carrying your phone with you. This feature will be adored by runners especially while also travelling. It has a built-in microphone and loudspeaker which helps you to take your calls on the go without having to reach for your phone time and again. Gear S3 is easy on connectivity as it can be connected via Wi-Fi plus Bluetooth. Gear S3 is also popular for its battery life. The device has non-removable 380 mAh Li-Ion battery which can be charged by WPC wireless charger. The battery can last up to three days, but if you turn off the always-on mode and GPS tracking, the battery life gains an additional two days. 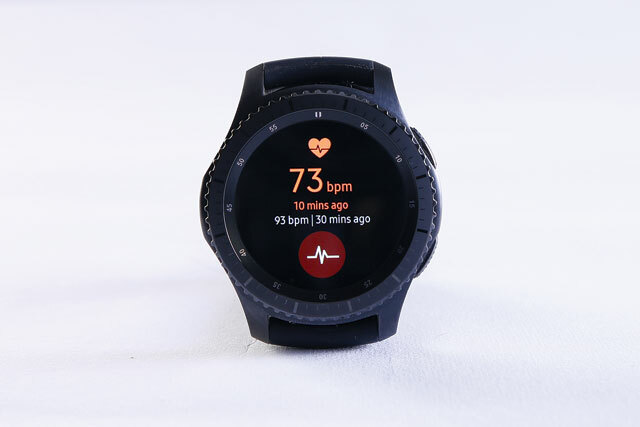 Gear S3 has also kept intact the fitness features of Gear S2 like heart-rate monitor, altimeter, and barometer and the S Health app is a complete doctor on your wrist. For a price of Rs. 41,900, Gear S3 is a good buy for the features that it offers. It’s a quality watch, the health features are brilliant and you get fantastic battery life. It has set a benchmark and is a wearable device to look forward to this year.